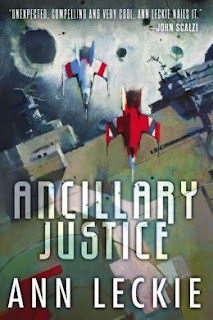 Ann Leckie's 2013 science fiction novel Ancillary Justice is categorized as Space Opera. That's fair enough, I suppose. It has aliens, interstellar travel via jump gates, and intergalactic Empires vying for power. That said, tonally and thematically, it is closer to Post-Cyberpunk. AIs and their Ancillaries- the protagonist, Justice of Toren/Breq is such a being, with modified human bodies networked with one another and slaved to a ship AI. All of the parts share a single collective experience and think of themselves as a single person, albeit one comprised of many bodies and many brains. Networked Clones- Anaander Mianaai, ruler of the Radch empire, continuously produces clones of herself. The clones are networked to one another(while within the same star system) and they all think of themselves as a single person. Her many clones travel the Galaxy, allowing her to rule over a highly-diffuse realm(basically James Patrick Kelly's Solstice, cranked up to 11). Leckie explores each of these characters' sense of self, to various degrees. She gives us a first person view of Breq's existential crises, first when her individual units lose their network connection, then when she is ordered to kill her favorite captain, then once again when Justice of Toren is destroyed leaving only a single surviving Ancillary. We are also offered a second person view of Anaander Mianaai's own long-running crisis as her clones develop differences of opinion. This rift within herself results in subtle intrigues and ultimately in armed conflict between the various factions of self. We're also offered Breq's third-person view of the Post-Humans and their more individualistic culture, which nevertheless includes an ethic of helping others to find their own place in the system. This is sort of the opposite of the other book I'm reading, Hubert Dreyfus and Sean Dorrance Kelly's All Things Shining. A major theme of All Things Shining is the vast, untranslatable cultural gap between previous epochs and our own Modern Age. 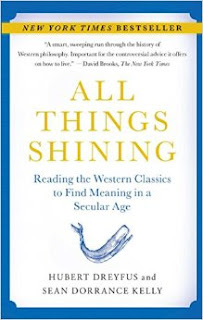 The authors explore many examples of this, but one such case is their claim that our existential crises today are utterly alien to our forbears. That, without the broad array of choices that our modern situation offers us, these questions of self-definition simply don't arise. "It is not just that in earlier epochs one knew on what basis one's most fundamental existential choices were made: it is that the existential questions didn't even make sense." p.13. In the same vein, Dreyfus and Kelly also explore examples of past practices that seem utterly alien to us Moderns, yet which made complete made sense according to the world view of people at the time. For example, Helen recounts her affair with Paris in front of her Husband and polite company and is praised for "An excellent tale, my dear, and most becoming. "(Homer's Odyssey) The authors argue that this lack of embarrassment can best be understood by the Greek belief that a person's ultimate fulfillment is to become attuned to the gods(in this case Aphrodite). This is what Leckie is doing in Ancillary Justice--presenting us with a glimpse into a future society, whose own existential questions are be inherently alien to our own experience. What is it like to be a collective self? What sort of unique crises of identity does such a person face? Intellectually, we can only imagine the answers in terms of metaphors, but Leckie does better, taking a more impressionistic approach in her descriptions. Ancillary Justice is a book whose tones of stoic melancholy and irreparable loss stimulate our imagination to fill in the blanks where rational reflection hits a wall of inscrutability. To sum up, Ancillary Justice is high-concept Science Fiction at it's best and is sure to become, itself, a Modern Classic. I bought this book on a whim but couldn't get into it. You've convinced me to give it another shot.